Rising Zimbabwe football star Raphael Gombo (14) is set to join other young players for a two week trial stint at English premiership giants Manchester City. 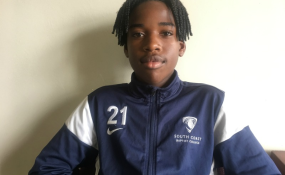 The Australia based South Coast Baptist College (SCBC) football academy member is expected in United Kingdom 21 January to start his trials. If he fails to impress the English champions, he will have a chance to try his luck at Bolton Wanderers FC in the Championship. "My parents were in contact with a football agent, who then got in touch with my football academy director and coach who is the one who got in touch with Man City junior coach... and they have invited me for trials for two weeks," Raphael told NewZimbabwe.com in Harare Thursday. "I hope to make it into the Man City FC juniors and open opportunities for other players from Zimbabwe. "We need this exposure as young players as this motivates you to dream big in your career." SCBC is based in based in Perth, Western Australian. "I have been playing football ever since I could stand on my feet and I have always loved playing football. "My dream has always been to play football at a professional level. "I have also won multiple awards both as a player and as a team from many junior competitions in Australia." The teenage star says his idol is world renowned Juventus forward, Cristiano Ronaldo. Stephen Posthuma, SCBC director of football said Raphael was a rising star any coach would want to have in their football academy. "The kid is respectful and wonderful; you would want all kids to aspire to be like him," Posthuma said. "He takes his school and football seriously, is easy to work with, follows instructions very well. He is an asset. "As a player, he is exceptionally quick, with exceptional speed as a striker and we sometimes use him as a winger." Posthuma said he hoped Raphael will catch his eye of the coach at Man City FC juniors. "He trains very well and I hope he will impress the coach there," he said.